the adventures of tartanscot™: "Behind the Scenes - Bespoke Furniture . . . "
When you're involved in living your day-to-day life, sometimes you forget how cool parts of your life REALLY are. Like when I tell friends of mine that I also custom design furniture They look at me with slightly furrowed brows. For people not in 'the business,' the concept of putting pencil to paper (I still love hand-drawing my designs) and having a proper piece of actual furniture several weeks later seems like magic. But, for me - it's just a ordinary activity at the office - and an necessary part of my ever-evolving home. Here is one of my favourite sofas, the "Abottsford" - as seen a few years back - that I had designed for my own home, the perfect length for my drawing room - and extra deep . 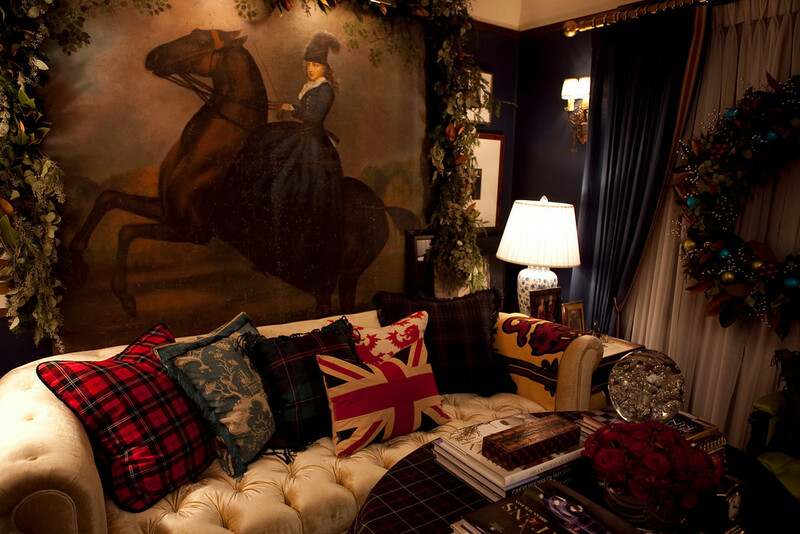 . . so I can use tons of decorative pillows. But, no magic needed. Just a excellent (and super friendly) upholsterer. And sometimes a bit of patience as one determines the proper lay-out of the tufting pattern . . .
And a progress visit to see how the textile looks on the piece. I love seeing the look of this ivory silk velvet. The way it reflects the light is amazing. And here it is safely returned to my own little home - all dressed for the holidays. In fact, I'm curled up on this very sofa - writing this very blog - about this very sofa. This is a new ottoman that I've been working on for a client. And, another success. Ready to be installed. But, now dressed up in chartreuse silk. With a new fitted back cushion and this time with welting instead of miles of brass nail head trim. And here, snuggled into my bedroom - I LOVE this bright textile, especially once it was back in the house! And speaking of my bedroom - I really wanted something special for my bed. A bit of leather. A bit of tartan. And here's where the miles of nail head come into play . . .
And I am so pleased with the results. It is just the greatest place to awake each morning. This post is so good!!! I love seeing your gorgeous place. Your bed is stunning and seeing the process of it all is just really great. I appreciate all the information you're giving here. all pieces are stunning! love the chartreuse! I think you got me when you said you love putting pencil to paper ...hand-drawing. Me too. You also must work with a wonderful furniture maker and upholsterer, these pieces are wonderful. Thanks for sharing. Love all these beautiful pieces. The chartreuse silk is stunning and adds just the right pop in your space. And your bed is fabulous. The tufting on these pieces is beautifully done!! Bravo! I love everything you have been working on. What a cozy home you have too. Thanks for sharing your views with me. The upholsterer did a beautiful job. Can you share who he is? Also, the new bed is superb! A great upholsterer and great vision. I loved to see the different phases and the stunning results. Scot, can you tell me more about the silk velvet used? How does it behave? I used a Robert Allen one and even looking at it makes a mark! and not nice marks either! Truly lovely, but my favorite among them is that absolutely gorgeous headboard. What a wonderful, contemporary looking tartan you used and the lushness of having the drape over your head! It must be nice to finally design something for yourself. All the best. I've been really happy with the way the fabric has held up - but, was also fortunate enough to have a red wine spill on the sofa about three days after it's delivery, so it rather quickly just became part of the house. Kind of like that first scuff on a pair of new shoes. Hell, I sleep on the sofa now! The chartreuse was actually left over from an old project - and had been loitering here in the office for years. That's way I never throw anything away! I just wanted something with a little privacy to it. I used to have a half-tester on my old bed - and loved the security it provided. What a fabulous peek behind the scenes of a fascinating creative process. And I'm absolutely coveting that chair that you upholstered in the chartreuse silk. Gorgeous! LOVE your fabulous bed and chair! Fun to see your behind the scenes work as well. I am over the moon for all that glorious tufting. 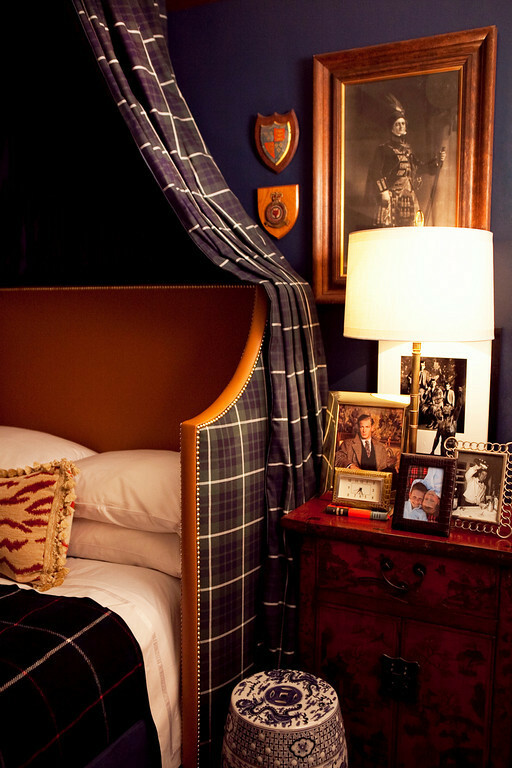 And the tartan on the piece made for your bed is so beautiful!!! That's why they pay you the big bucks (HOPEFULLY! )...because you are GOOD, Scot! Thank you for sharing! Scot- what an incredibly fun post! I just could get cozy in that living room and LOVE the bed!!! Thanks for giving us an insight to your home!! First off the bed is too die for. 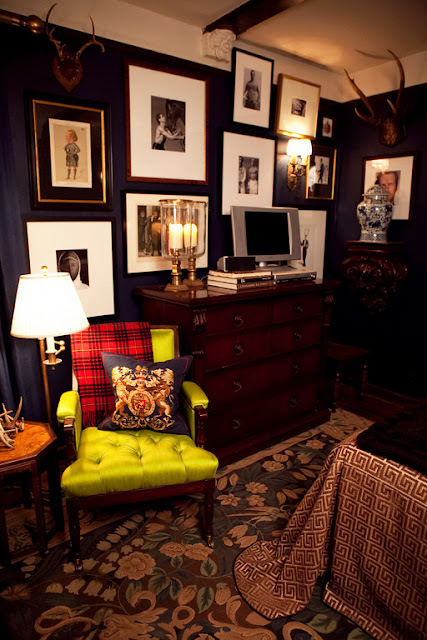 Secondly-two of my absolute favorites are tufting and tartan. Love the sofa and the chair is wicked. 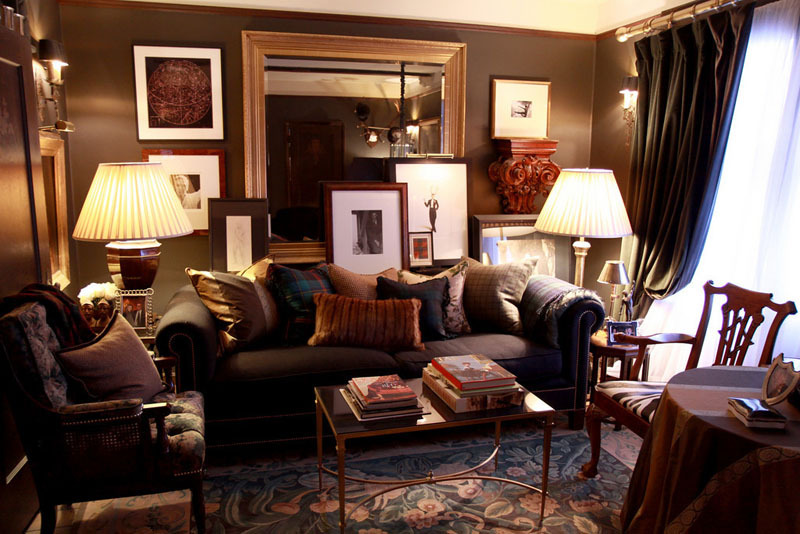 Since you visit your upholsterer midway you know how terribly labor intensive tufting can be. I just hate having to tie off buttons and especially hate keeping those deep crevices clean after it's home. But I guess you have someone for that. I do love the ottoman and that blast of color on your bedroom chair is quite nice. The headboard though might make me a bit claustrophobic. Beautiful home-thanks for sharing!